This article is the first of a two-part series critically examining the role of lawyers in assisting clients in denying responsibility for harms they have caused. If a person injures another, the moral response is for the injurer actively to take responsibility for what he has done. In contrast, the common practice within our legal culture is for injurers to deny responsibility for harms they commit. The immoral, in other words, has become the legally normal. 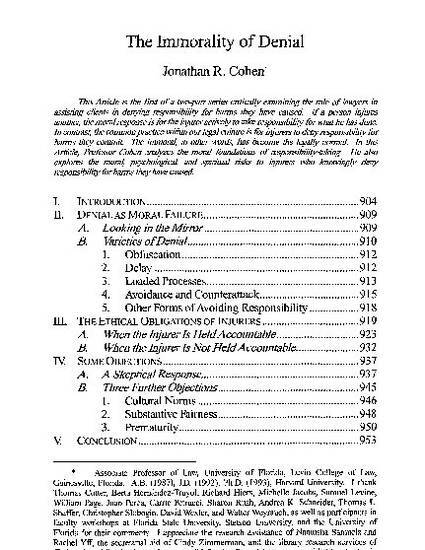 In this Article, Professor Cohen analyzes the moral foundations of responsibility-taking. He also explores the moral, psychological, and spiritual risks to injurers who knowingly deny responsibility for harms they have caused.